Crossfire II 1x24 is rated 5.0 out of 5 by 10. Our compact, rugged Crossfire II 1x Muzzleloader scope satisfies "no magnification" rules and provides a crystal-clear and ultra-bright unmagnified view. 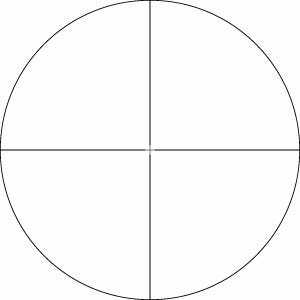 With generous 3.8 inches of eye relief and a vast, 95-foot field of view at 100 yards, the fully multi-coated optics and V-Plex reticle assure accurate shot placement in low light conditions. 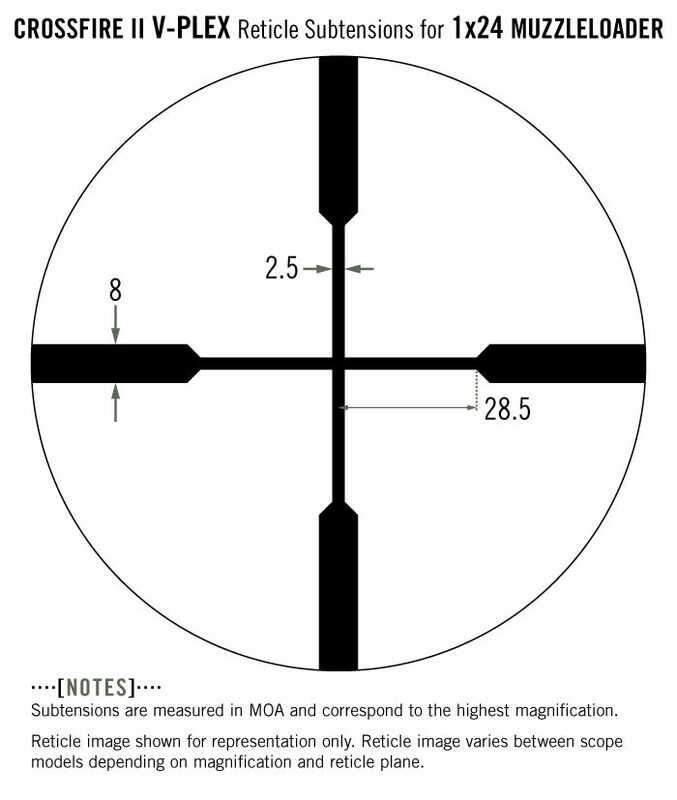 Subtension detail for the Crossfire II 1x24 riflescope with V-Plex MOA reticle. Rated 5 out of 5 by 1stButNotLastVortexScope from Outstanding scope! I do most of my shooting indoors or at moderate distances on our family's land, and was debating between a red dot or reticule for my AR. I chose the Crossfire II 1x, and couldn't be happier. The glass is crystal clear, the reticle is sharp, and it was almost dead-on accurate right out of the box. I am sold on Vortex quality, & will purchase additional scopes from them in the future. Rated 5 out of 5 by Luke from Had to get one when I heard it was discontinued Just bought one of these. I am amazed by the quality. I found mine for under $60! That is incredible for this quality of glass. I'll be hunting this fall with a shotgun muzzleloader and this fixed magnification scope should work perfect for buck shot and eventually roundball. Rated 5 out of 5 by Z arch from I would definitely buy this again I have this scope on my cva muzzeloader and i couldnt be happier with the quality and clarity of this scope it simply cannot be beat by far the best scope on the market for muzzeloaders and the best scope i have ever owned i definitely recommend this scope . Rated 5 out of 5 by Sherm from Clear as day! My husband and I bought this scope for our muzzloader last year. It was easy to sight in and my husband slayed a nice buck at 250 yards! We were both blown away by how clear this scope was and we were even more thrilled at how well it performed! Rated 5 out of 5 by BasicHunter from Better than irons I found these on sale at cabelas for $27 and bought 3 of them. I have 1 mounted on a muzzle loader and have another on a slug gun. It's far better than the traditional iron sights. I just wish they still made these. Rated 5 out of 5 by BigBen from Great For Muzzleloaders! I put this scope on my muzzleloader for a muzzleloader tag. It was great work perfectly. Too bad its discontinued because its a must have on a muzzleloader where you can only have a 1 powered scope.